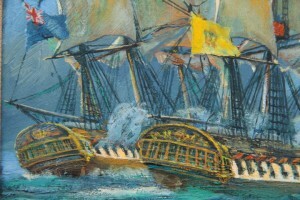 It was this frigate action that caused Spain to enter the Napoleonic Wars. 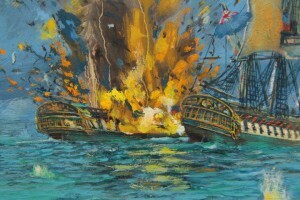 In this painting you see the height of the combat. 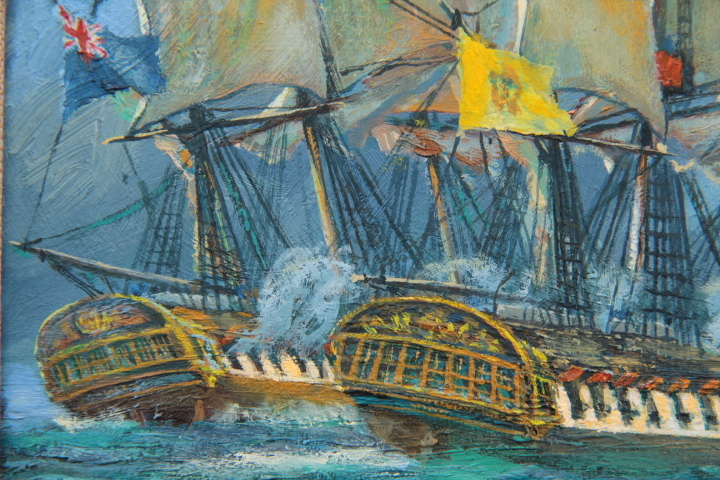 The British frigates, more deftly handled have taken classic positions off the quarters of the Spanish ships. Intelligence was believed by the British Government who sent 4 British Royal Navy frigates to arrest 2 Royal Spanish Navy frigates. The interception was managed faultlessly. 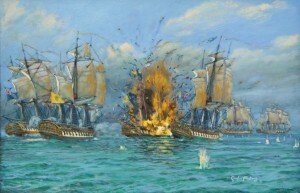 Unfortunately there were 4 Spanish frigates, all laden with an immense treasure, unprepared for combat, Spain was at peace. Captain Graham Moore (HMS Indefatigable, 44) was under orders to ‘detain’ the Spanish ships. 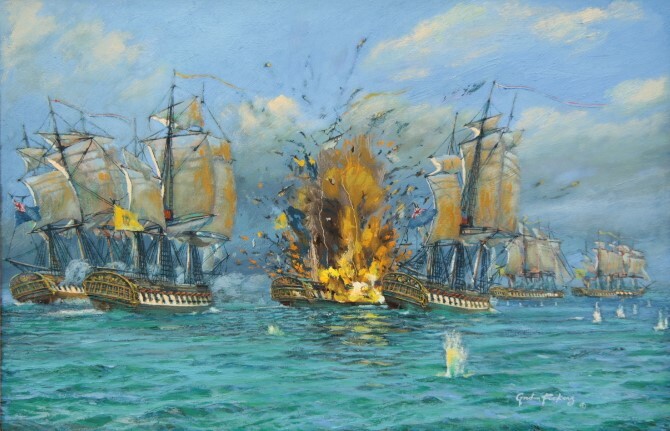 Rear Admiral Don Joseph Bustamente in the ‘Farma‘, give odds of 4 against 4 was not going to surrender with out a fight so fight the Spanish did and most gallantly. The Spanish ships were Farma, Medea, Mercedes, Clara, the British were, Medusa, Indefatigable, Amphion, and Lively. 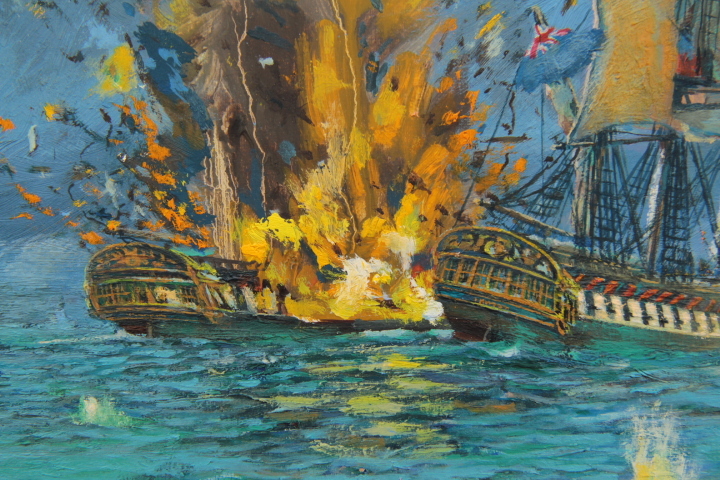 One of the four Spanish frigates, the “Nuestra Senora de las Mercedes”, in an action with the 4 British frigates blew up with great loss of life and promptly sank, 5th October 1804. At the time, this action was much reported and after the event, the subject of a major debate in the House of Commons, London. “The loss of the Nuestra Senora de las Mercedes” version 2015 detail. The the full story of “Nuestra Senora de las Mercedes” and her treasure is, as is often the case, is much more intriguing and not over yet … her wreck has been located. ‘ The Loss of Las Mercedes ‘ was one of the 35 paintings shown at the invitation of the European Parliament, Brussels, May 2011. We trust you are enjoying your visit to this site, found something you like and follow our posts. Kindly spread the word to all the collectors you know who enjoy and appreciate fine art, if you think this project deserves success, you can help us make this project widely know, thank you.